Large numbers of businesses allow customers to make an inquiry, complaints, order booking, and payment commitment etc through phone that is usual and customer-friendly method to execute any types of tasks. It is also important to keep such conversion recorded in order to execute the customer's need as well as for future purpose. Keeping record of calls are of course necessary for business that often needs record calls. They want to keep the customer happy with their services because happy customers are proportional to the growth of such business. Today, voice recording is specifically made by most organizations whether they are government or public or private, to keep log of the entire calls that are received from the customers. 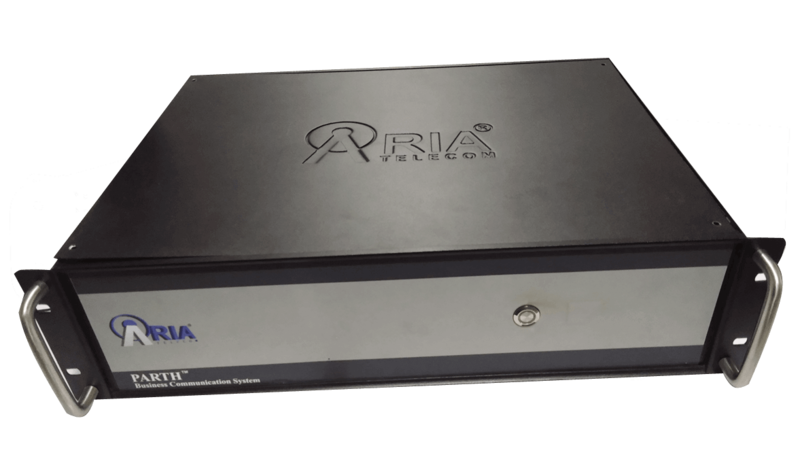 Aria Telecom gives the full solution like voice recording system that keeps your calls recorded in the voice logging system and computer for any future reference. These calls are supportive in building future decisions as well as analyzing the strategies and revising as per the need of customers. 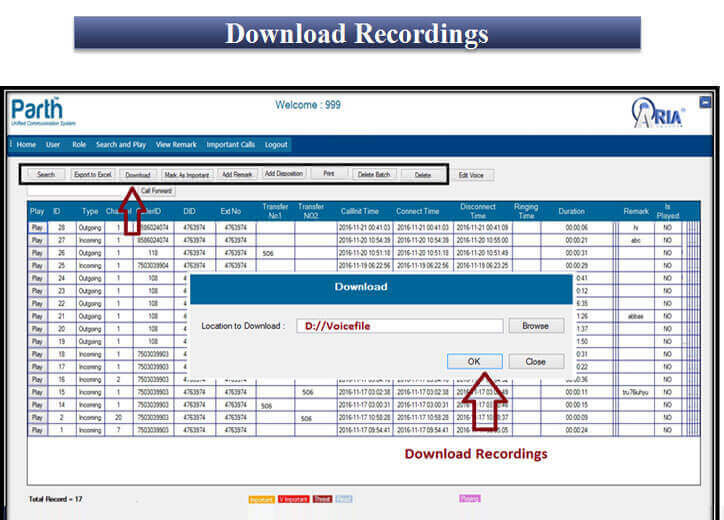 This recording tool keeps all recorded file in the PC and tool, and can be accessed at any time. Benefits are loads if you use voice logger that allow you to record the calls from customers, agents, telemarketing agents, prospective clients, existing customers etc. The tools will help you in automating the recording calls procedure, and you don't have to go through lengthy procedure when you receive calls from customers. Ours modern and standard quality telephone recorder (also called analog telephone recorder) is easy to install, available as embedded and PC based. Embedded logger you can use separately and just connect to phone to keep recording of calls and store all information related to calls in this standalone system. But PC based logger is connected to the PC and store the entire information in Hard Disk of Computer. We are providing also user-friendly and updatable voice recording software that help in keeping latest changes in market. We provide telephone voice recording system in delhi ncr along with voice logger software that help in keeping large number of files in a database for quick access. The clients can use our solution like isdn pri recording that works also as e1 recording and ip recording, and made according to current trends of communication in the market. Integrated chat support like messengers is provided by us to our clients, helpful in communicating instantly along with sharing the files. Our voice recording solution allow you to keep eye on the employees and make sure for any misuse of ongoing calls that lead to any further loss. PARTH 30R is a solution for the call Centre which can run 30 agents at one go . This product supports the simultaneous recording of all the 30 channels . It is directly connected with the ISDN PRI and has the easy installation steps . 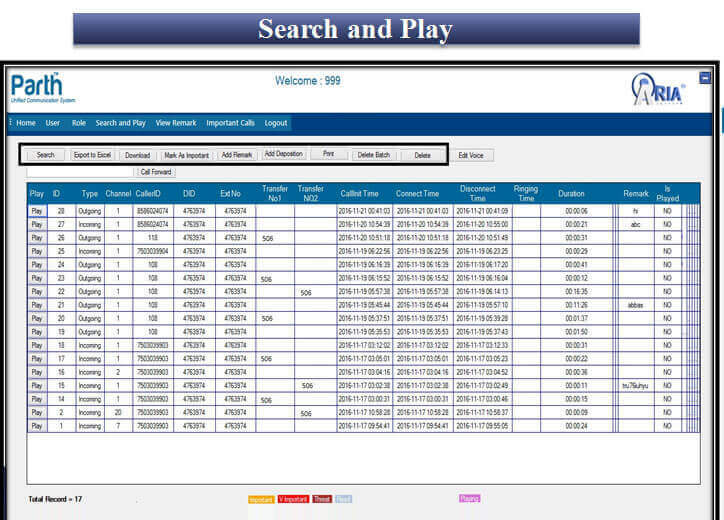 It has a user friendly interface for monitoring and filteration of recordings purpose. PARTH 60R is a solution for the call Centre which can run 60 agents at one go . This product supports the simultaneous recording of all the 60 channels. It is directly connected with the ISDN PRI and has the easy installation steps. 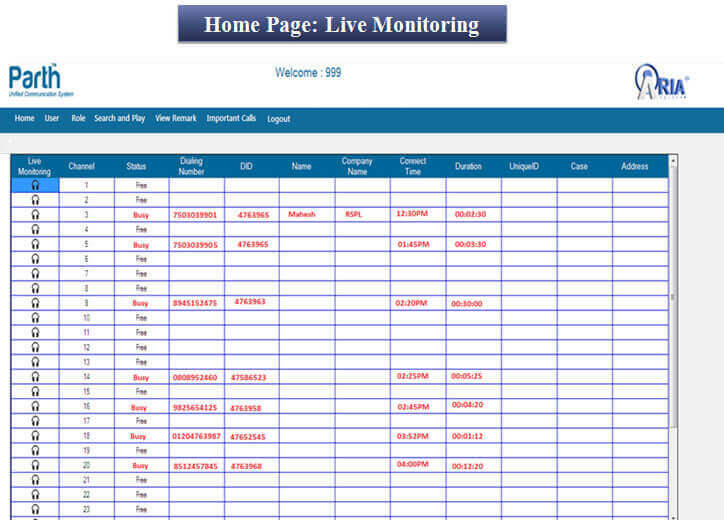 It has a user friendly interface for monitoring and filteration of recordings purpose.